It’s September & still way too hot here! I am so excited for fall! Growing up, I never liked it much. However, now I love the weather, the chill in the air, the clothes…boots, scarves, sweaters :) The changing leaves and the way they crunch when you walk over them, and of course, the Holidays! I wish we could just stay in Spring and Fall all year. Halloween is one of my favorites! I have tons of Halloween posts to come, but that is still FAR away, and I am not one start decorating months ahead for a holiday.. On October 1st though, well, this house will be covered in halloween decorations and I will enjoy every minute of it. For now, FALLLLLL decorations! 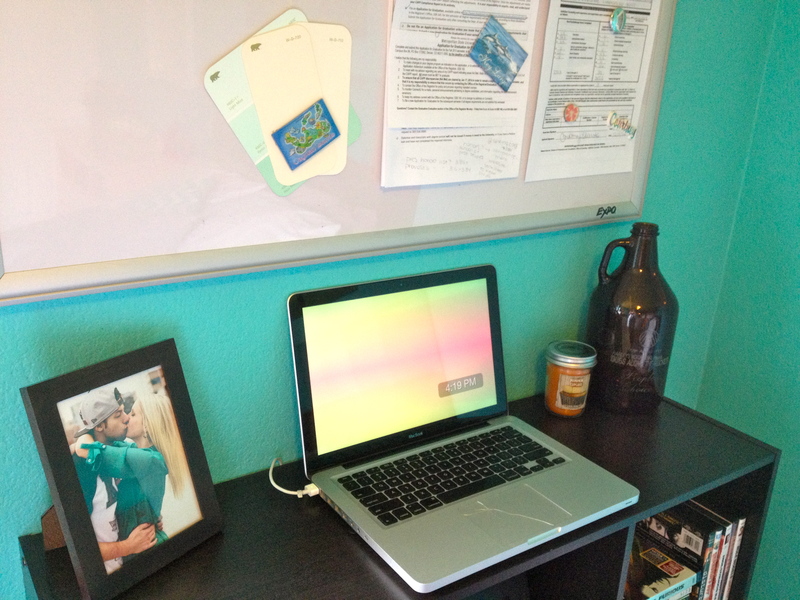 I kept it very simple for my room, but I wanted to add a little something to make it feel cozier. 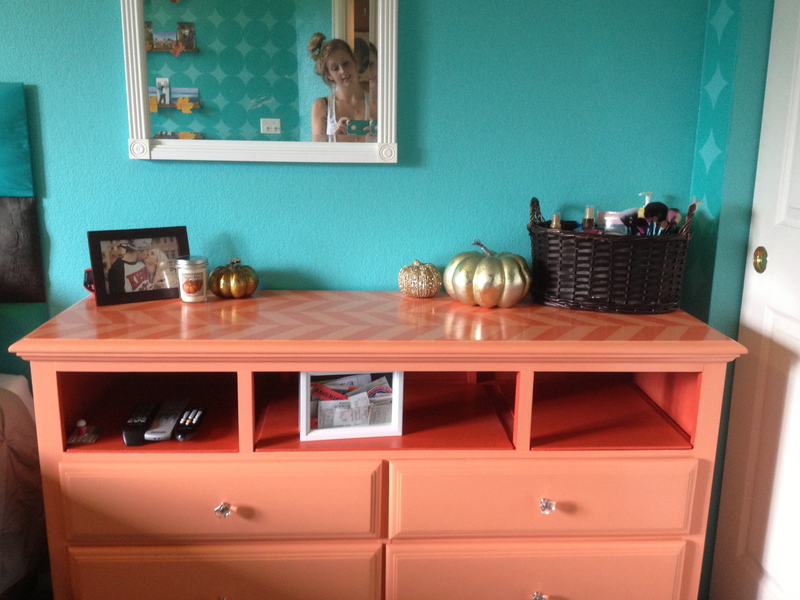 You will also see my Tv-Stand, completely re-purposed, for now, until it has a real home. 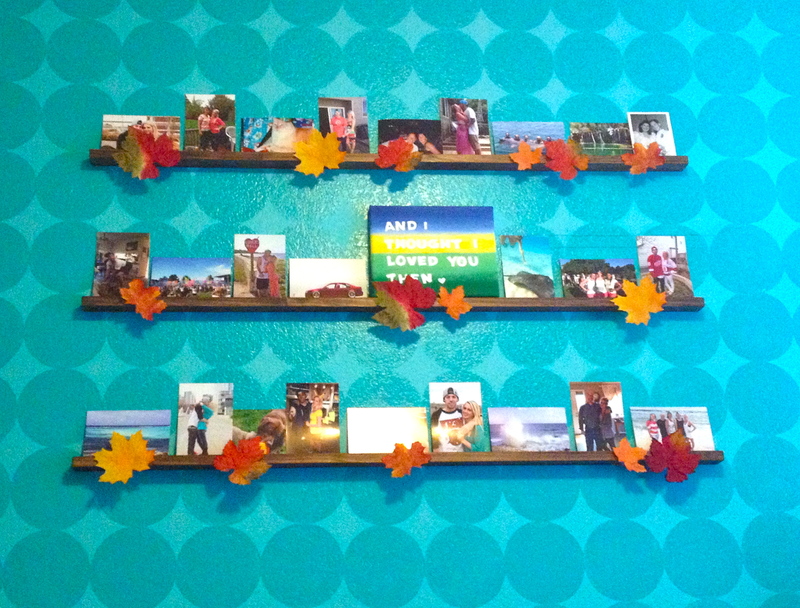 I started with some fake leafs and just taped them on my picture wall shelves. More on those shelves in this post. 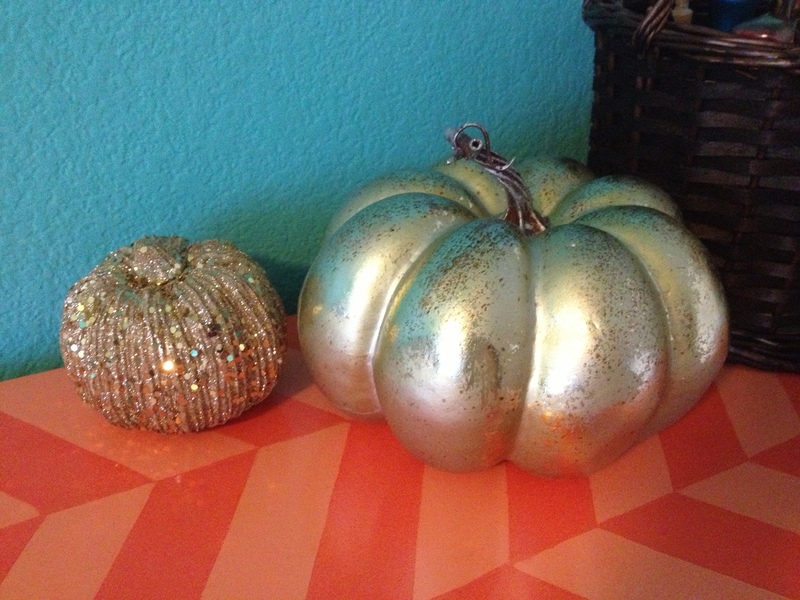 On my makeshift vanity/nightstand/dresser I placed a few metallic pumpkins. I grabbed a few of the mason jar candles from bath and body works today! They have all of their fall scents out and they were on sale 2 for $15, so I saved $10! Love a deal. Plus I really love the jars… and will re-use them when the candle is gone. The one below is pumpkin pecan waffles, and smells amazing! And lastly, I just have another candle on the other wall, this one is Pumpkin Cupcake. I placed it with Bobby’s Car Award from a show this summer. He won People’s Choice, and I just think the trophy is very fallish… ?? yea… It screams fall to me. Also, how do you all feel about the last paint sample below? ?… it is showing more yellow in this picture though. I want a creamy white for my walls! I would love some fall pillows for my bed. ALSO!!! If I had somewhere to put a wreath, I would totally ask Rusty from The Ritzy Wreath on Etsy for a hand-made wreath. They are all so cute! Plus she has a new Fall Coupon, for FREE shipping until October, 31st. Go place an order!